Everyone has to visit Sydney’s Royal Easter Show at least once in their lives. I’m proud to say that finally I take the plunge in 2014, and as they say, better late than never. There’s something for everyone: thrilling carnival rides, ridiculously huge farm animals, shopping, entertainment, competitions, lots and lots of different types of food to try, and then there’s the CWA Tea Room. 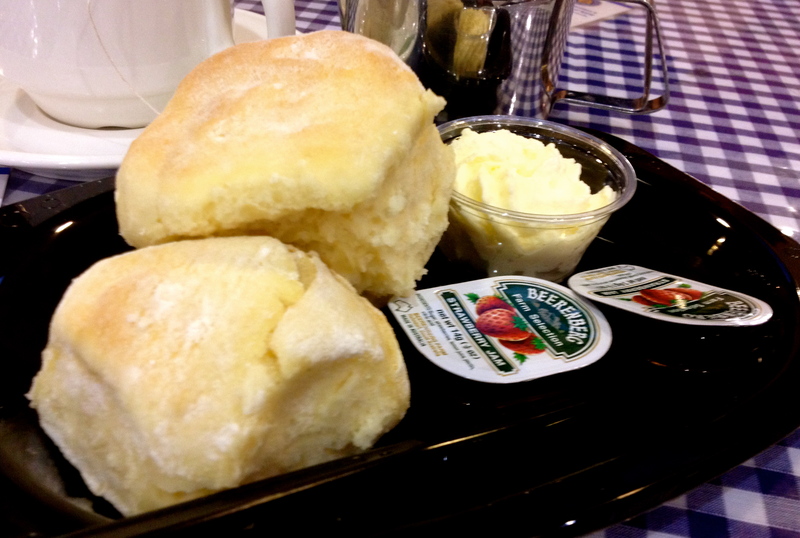 Manned by volunteers, the Tea Room pumped out a phenomenal 40,000 scones at the 2013 show over 14 days. Those numbers are insane and it just goes to show that a lot of people love a good homemade scone! Serving this many scones means that things are kept simple. The jam is served in portion-controlled packs, but at least the Beerenberg jam is a rung up from the usual Kraft variety. The cream is delectable: thickly whipped, chilled, with a hint of sweetness. For the ultimate piping hot scones straight out of the oven, keep your eyes peeled on the sign that lets you know when the scones will be ready. Otherwise, whilst waiting to be devoured (which isn’t long), the scones are kept under a cloth to keep in the freshness. If you want to take home the secrets to the CWA success and make your own award-winning scones, pick up the CWA Recipe Book ($22) and a jar of homemade jam. The annual Easter Show is held for 14 days over the NSW school holidays and the Tea Room operates from 9.30am to 6pm daily over the whole duration. Tea: A choice of Premium Blend, English Breakfast and Green Madura tea bags served in a small pot. Overall: An Easter Show institution, what is the Show without the CWA ladies?